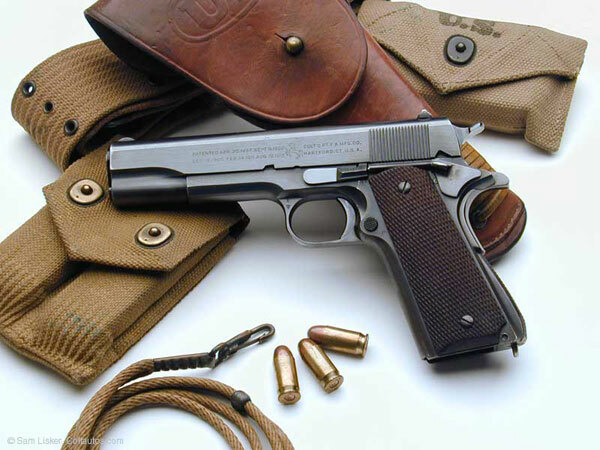 Colt 1911A1 serial number 721200 and accessories issued to Lt. Samuel Kalikman. Lt. Samuel Kalikman was born in Camden, NJ. He graduated from the University of Pennsylvania in 1934 and received his law degree from Harvard in 1937. He enlisted in the U.S. Navy (at age 28) shortly after Pearl Harbor. He was commissioned as Ensign and eventually was promoted to Lieutenant J.G. 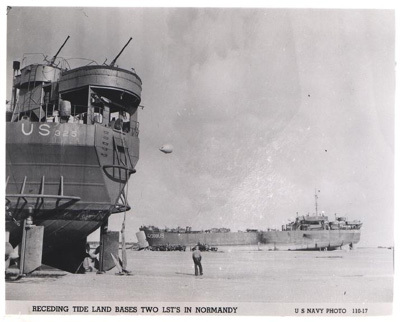 He served as the navigation officer on an LST. Lt. Kalikman participated in a number of invasions including the D-Day landings in Normandy. On D- Day his LST landed British troops on Gold Beach. He also served in England, the South of France, North Africa, India and in the Pacific near the end of the war. Gold Beach was the code name for the center of the landings on the Normandy coast. The British 50th (Northumbrian) Infantry Division of the 2nd Army under Lieutenant General Miles Dempsey was to land at H-Hour+1 (0730), seize Arromanches and drive inland to capture the road junction at Bayeux. 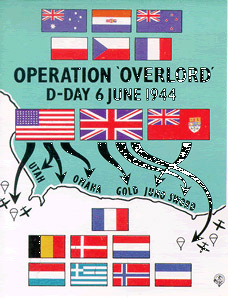 Its additional objectives were to make contact with the US forces to the west at Omaha Beach and the Canadians to their east at Juno Beach. In addition to the 50th, the 47th Royal Marine Commandos were to land on sector Item and to attack south of Arromanches and Longues and take Port-en-Bessin from the rear. 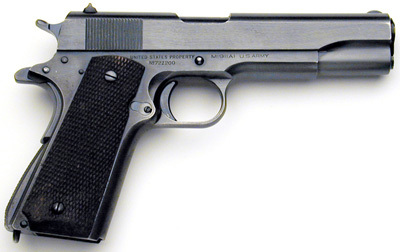 Model 1911A1 Serial No. 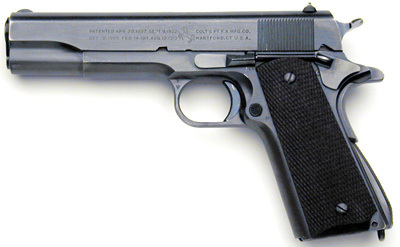 721200 - A 1940 production pistol that was part of the second Army contract for that year. The second order ranged from sn 719753 thru 721977 inclusive with deliveries beginning in October. 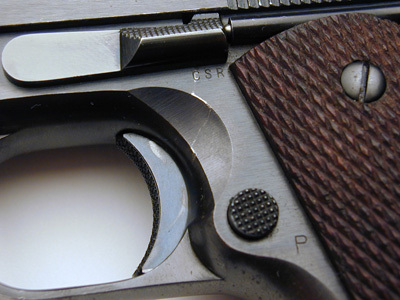 This pistol was delivered to the Commanding Officer, Springfield Armory on December 27, 1940. Serial Numbers 721190 to 721263 inclusive were then delivered January 23, 1941 to Naval Operations Base, Norfolk, Virginia. 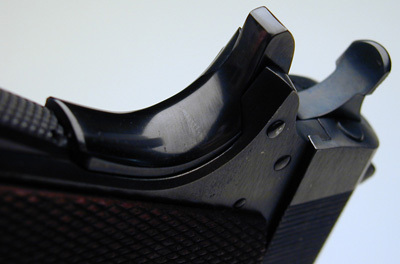 There is a P proof on the top of the slide, in front of the rear sight and also a P on the left side of the frame near the magazine release button. The barrel in this gun is marked COLT .45 AUTO on the left side, with the G in front of the barrel lug on the underside of the chamber. There is a P on the left lug. 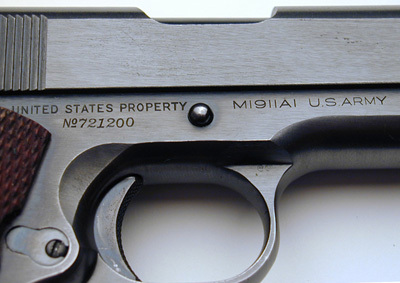 The initials of Major Charles S. Reed, Officer in Charge of Outside Inspection, were stamped on all M1911A1 pistols manufactured in 1940, signifying government acceptance of the pistol. His initials were stamped on the left side of the receiver below the slide stop in accordance with Ordnance drawings. The initials C.S.R. were also stamped on the top of the receiver near the disconnector hole to indicate provisional inspection, replacing the previous letter "R" within an oval. Rear grip safety showing blued finish.